Organizing and decluttering guru Marie Kondo is everywhere. She is the bestselling author of The Life-Changing Magic of Tidying Up and star of a hot Netflix show. The key principles of her methods resonate with many people and may be applicable for your pharmacy. Start with vision. Before decluttering, Kondo has clients determine the lifestyle they want. Go category by category. Kondo works with clients category by category. She starts with clothes and then moves to books, papers and miscellaneous items. The final category is sentimental items. Find the joy. A core element of Kondo’s approach is deciding whether an item “sparks joy.” If it does, keep it. If not, discard it. Display things beautifully. Once clients have discarded items, Kondo focuses on storing and displaying the items they’ve kept. Each element of this tidying up philosophy can lead to a better pharmacy. What is the unique vision for your pharmacy? A clear vision allows you to explain what makes your business stand out. A vision drives decisions, from what to stock to your marketing messages. Every element of your pharmacy should reinforce your vision to customers. For example, if your vision is “modern” but your fixtures are outdated, it’s time to replace them. If your vision is “community centered” but you don’t have services for key populations, think about how to add new services to draw patients in. “Tidying up” your pharmacy isn’t done in a day. You can approach your pharmacy by section or by segment. For example, first review OTC products and then durable medical equipment. Or take a broad approach: review products, services, marketing and then systems. Taking time to dig into each aspect of your business is critical to long-term success. Whatever approach you take, you must consider every item. Review each item to decide what to keep and what to discard. The basic measure of whether something in your pharmacy sparks joy is whether it satisfies your customers (giving them joy) and turns a healthy profit (giving you joy). Tidying up also applies to marketing and staffing. Tidying up marketing: You may have used the same marketing materials for years with no evidence they are driving revenue. Discard them and find new, more effective approaches. Tidying up your staff: It may be time to thank an unproductive staff member for his or her service and let that person go, because they are dragging down the entire staff. If someone tells Kondo they want to keep something because it may come in handy someday, she replies, “It never will.” Many items people think they need, such as product manuals, can be found later if necessary. In your pharmacy, check how much inventory you carry “just in case,” when your wholesaler could deliver it the next day. Study inventory turns and the products you are returning because they reach their expiration date before they sell. After decluttering, Kondo helps clients better organize what remains. If that’s not your area of expertise, rely on planograms and hire a staff member with a good eye. Because you are in the pharmacy every day, you can become blind to how your store looks. Stand back and observe customers. Learn which displays are catching their eyes and are getting them to add items to their baskets. Once you have removed items that don’t spark joy, add items that do (by satisfying customers and boosting profits). A key benefit of tidying up your pharmacy is making room for new products or services. For example, replace a low-margin item near the cash register with a unique higher-margin item. This is how tidying up can drive greater profits. 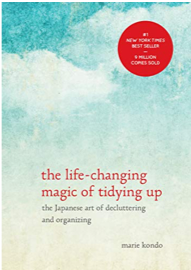 The root of tidying up is having a clear vision, reviewing every category and every item, and keeping those items that create joy for customers and profits for you. Once you decide what to discard and what to keep, present the items you keep as beautifully as possible. While you don’t need to adopt all aspects of Kondo’s methods, her basic ideas can provide a new way of thinking and can help your pharmacy increase profitability. The bottom line: Keep what you need and organize it well.